During the holidays, we tend to accumulate wine corks when we have get togethers. Rather than toss them, I prefer to come up with fun ideas of how to use them creatively. If you have a handful of wine corks, you have the makings of a sweet and simple wine cork snowflake ornament. Make your own wine cork snowflake ornament when you give this simple tutorial a try. In no time, you can have an ornament perfect for adorning your tree or even giving as a gift. Take a look below and see how you can get started in making your own wine cork snowflake ornament. Begin by cutting your wine cork into fourths. Using a serrated knife will make this job easier. Carefully saw the cork until you have 4 pieces. Repeat the process until you cut up four corks or have about 13 discs. You can now prepare to assemble your discs into the snowflake shape. Begin by creating a daisy shape. Place one disc in the center and build 6 discs around it. Just add glue to where the discs meet and press together until dry and secure. Now, you want to build off of the daisy shape. Glue another disc to the disc you just adhered. You will notice the snowflake shape now taking place. Continue to press the discs together until secure. Finish by adding a little white paint to the discs. We skipped every other disc so the snowflake would have a white and natural color to it. It also lends itself to a distressed look. Now all you need to do is add your ribbon for hanging. Simply cut a length of ribbon and glue it to the back of the ornament. Your wine cork snowflake ornament is now ready to be displayed! 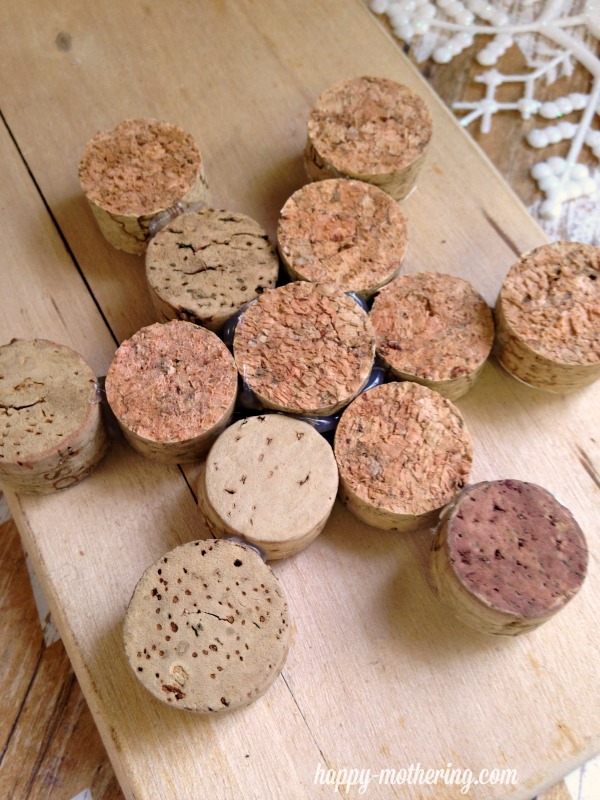 Give this simple craft a try and see how easy it can be to turn wine corks into something festive and fantastic! 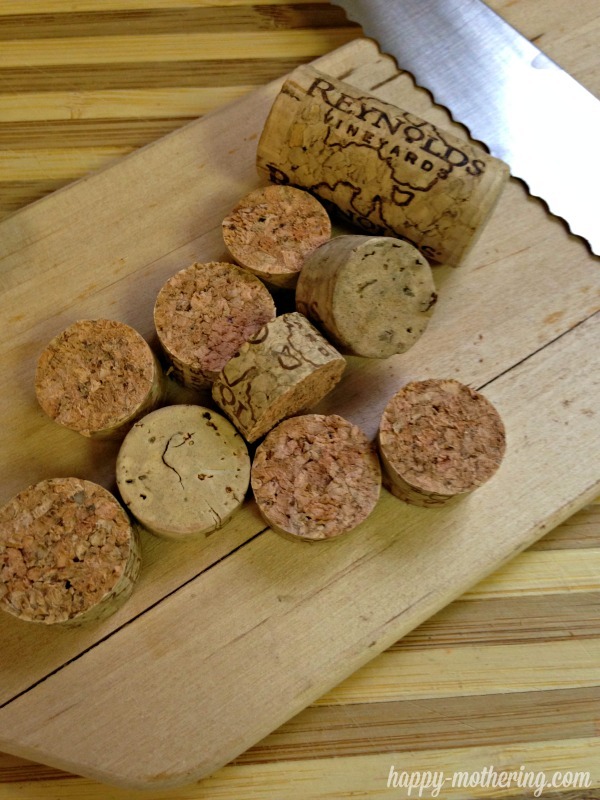 How do you use your leftover wine corks? What a great idea and it looks like a lot of fun to do with the kiddos! Thank you for sharing on the Oh My Heartsie Girls Wordless Wednesday. This is so cute and simple that I’ll definitely find the time to make it before Christmas Day this year! These turned out so cute. I have a giant bag of corks I have been wanting to make something with! Will def. be making a few of these for the tree! If you have a spare second this week, head over to my blog and link up! I would love to have you!! Thanks so much for sharing your DIY wine cork snowflake ornament with Foodie Friends Friday this weekend. This is easy to do and the kids can help with painting. Happy Holiday! We look forward to seeing you again soon with another terrific DIY or recipe.